Tintin Heart: On the subject of ATCs - Two More! I nearly forgot two more ATCs I made for a swap event over at Ditzy-Craftymessers. The theme is Vintage. The ATCs were inspired by an embossing folder and I wanted to create the effect of a worn Ormalue clock. I inked the inside of the embossing folder with distress ink and spritzed the paper with some water to help get a deeper image. The first attempt I rubbed some gold effect ink around the image and touched up the embossed image with tumbled glass. This gave a coarse, worn effect. 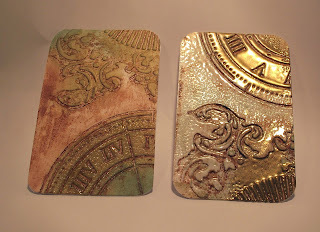 ATC number two was given the same treatment but I added a stage with some clear embossing powder across the centre of the embossed image and gold embossing powder on the edges. When I heat set the powders I got this great, almost enamel effect.